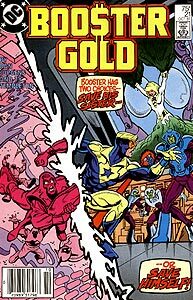 Cover Description: Booster Gold charges through a dimensional barrier, where Skeets is battling three aliens in a red-tinted, limbo-esqe environment, to another world where Michelle (dressed as Goldstar) is being held against her will by three differently costumed aliens. Brief Synopsis: Booster's search for his missing sister leads him to a planned alien invasion. Skeets states that Michelle Carter has "appropriated" the Goldstar uniform, though it is never explained how he comes to this conclusion after the costume was found missing from its closet in the previous issue (Booster Gold, Vol. 1, #20). Booster brags that his force field could stop a Sherman tank blast. The U.S. Army's Medium Tank M4, informally dubbed the "Sherman Tank," was the primary tank used by the Allies during World War II. Most Shermans were equipped with a 75 or 76mm gun used in anti-tank roles. Booster holds a ticket stub for seat 55, section C "Minneapolis Stadium" for a Minnesota Twins baseball game. Since 1982, the Major League Baseball franchise Minnesota Twins have played their home games in the Hubert H. Humphrey Metrodome in downtown Minneapolis, Minnesota. Their previous home was Metropolitan Stadium, not "Minneapolis Stadium." The Minnesota Twins defeated the St. Louis Cardinals and won the 1987 World Series on their home field in October 1987, the same month as the cover date of this issue. Cameo appearance of Wonder Girl. Booster speaks to Wonder Girl for the first time. Though he appeared in two issues of Teen Titans, Booster never actually met any of the Titans themselves. Wonder Girl confirms that the Teen Titans fought the aliens from Dimension X on several occasions. These are depicted in Teen Titans, Vol. 1, #16, #20-22. In addition to the Teen Titans fighting the aliens from Dimension X, issue #21 also featured the first meeting between the Titans and Hawk, who appeared in Booster Gold #16 and #17. Booster refuses Wonder Girl's offer to help him with the alien invaders, demonstrating an aversion to share the limelight with even a group as august as the Teen Titans. Despite Booster's previous insistence that he is primarily concerned with recovering his sister, he can not stand the thought of needing assistance to complete the task. Trixie and Dirk appear uncommonly close, with Trixie offering to make Dirk dinner at her place. This is a stark change in direction from previous issues in which Trixie preferred to avoid Dirk's company. FIRST APPEARANCE: First appearance of MacKenzie "Mac" Garrison, Booster's new Vice-President of Booster Gold International. Dirk considers her presence an insult to his business skills. Booster comments that Minneapolis is one of the few towns in the DC Universe not to have its own superheroes. Though the city may be lacking superheroes, it has been home to a few superhero creators, including Dan Jurgens. Booster and Skeets fly by the IDS Tower in downtown Minneapolis. The 55-story structure was built in 1973. FIRST APPEARANCE: First appearance of Rangor, master of the Dimension X aliens. Like all of the Dimension X aliens, Rangor has the peculiar speech pattern where he begins almost all statements with a two-word exclamation. Booster arrives at the Hubert H. Humphrey Metrodome and immediately makes a wisecrack about its "inflatable top." The roof of the Metrodome is the largest Teflon-coated structure in the world (10 acres of fiberglass 1/16 inch thick) and is indeed held aloft by air-pressure alone. The roof has deflated on several notable occasions, though never causing any casualties. POWER DOWN: Booster sacrifices his left bracelet to stave off the energy-feeding creatures of the buffer dimension between Earth and Dimension X. Apparently, Booster's power-suit can still function with the energy rods contained in only one of Booster's wristbands. Boosterrific Review: To the casual reader, this issue will be pretty standard superhero fare. However, it certainly qualifies as the beginning of the darkest chapter of the story of Booster Gold, and is therefore noteworthy in the Booster Gold chronology as greater than the sum of its parts. This issue masquerades as a straightforward "Booster Gold saves the Earth" story. Ty Templeton is a personal favorite inker, and his work accentuates Jurgens' self-proclaimed "pictures," placing the characterization, dialogue, and action scenes on solid, equal footing. (From this issue forward, Templeton is to be the "regular" inker of the series, though he will only ink half of the 4 remaining issues in is series.) Booster confronts a number of insidious and powerful aliens, yet the real enemy of this story is Booster Gold's hubris. Booster assumes that he is smart, powerful, and resourceful enough to handle whatever threat he encounters. He'll soon learn that he is dead wrong. NO! NOT KIRBY PUCKETT! A bit slow but Boosterrific is dead on-Booster's pride is the real bad guy here.